439 Squadron was formed in 1943 at Wellingore in England, it incorporated personel and equipment from 123 Army Cooperation Squadron, the unit was based in England, France, Belgium, The Netherlands and Germany during world war II and were disbanded at Flensburg, Germany at wars end. Reformed in september 1951 at RCAF Uplands they went to Marville, France in 1955 as part of 1st Wing. When France expelled all foreign military units from its territory the unit moved to Lahr and later to CFB Baden-Soellingen in Germany. 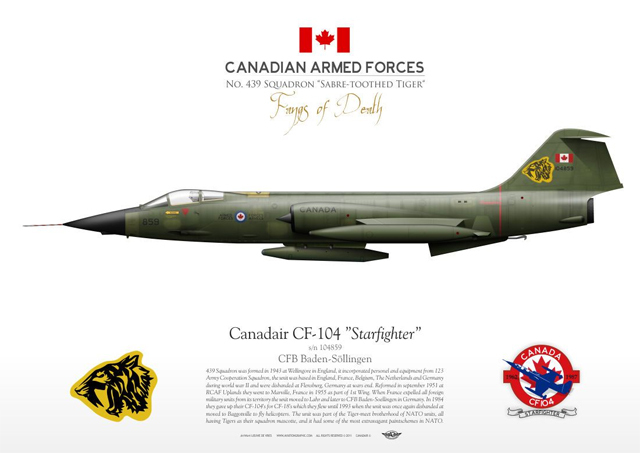 In 1984 they gave up their CF-104’s for CF-18’s which they flew until 1993 when the unit was once again disbanded at moved to Baggotville to fly helicopters. The unit was part of the Tiger-meet brotherhood of NATO units, all having Tigers as their squadron mascotte, and it had some of the most extravagant paintschemes in NATO.